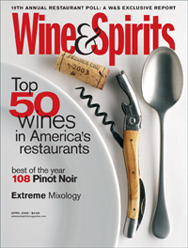 Each year Wine & Spirits publishes a special issue that reports the results of their annual survey of wine sales in restaurants — information of more use to trade professionals, I imagine, than to wine lifestyle readers. Although the sample is relatively small — 309 Zagat -ranked U.S. restaurants participated in the 2008 survey — and restaurant wine sales are probably unrepresentative of broader market sales, I still find the trends reported here to be of interest, especially since many of them reinforce data I have found elsewhere. Some of the trends are unsurprising to any restaurant wine-drinker. The importance of wine in restaurants continues to grow — over 70% of the restaurants reported that wine was a larger percentage of their total sales in 2007 compared with 2006. More restaurants are paying more attention to wine and wine-drinkers and increasing sales accordingly. A second non-surprise is this: restaurant wine costs more. More than 60 percent of the surveyed restaurants reported that the average price of the wine they sold increased in the last year. Personally I have been staggered at the price of wine in some restaurants recently. There are both demand and supply drivers behind this trend. Restaurants have an incentive to raise wine prices, of course, but nobody forces diners to buy the stuff. Some of the price increase is demand-side — educated (or status-seeking) wine consumers choosing more prestigious and expensive bottles. Smart restauranteurs and their sommeliers take advantage of the wine boom by offering interesting and hard-to-find wines, which attract wine enthusiast diners and generate higher revenues. So higher prices are the result of education, enthusiasm and strategic behavior. We pay more because we are willing to pay more, up to a point at least. The falling dollar is another part of this trend. Cheap dollars mean that restaurants have to pay more for imported wines, which drives up costs and prices. The pass through effect of the exchange rate changes is not yet complete, however, so you can expect even higher prices in the future. Rising wine costs are a supply-side driver of higher wine prices generally. The recent trend to more wines from Argentina and Chile is partly a reflection of the fact that the dollar has not fallen quite so far relative to these currencies, so South American wine is a relative bargain. The weak dollar also affects the demand side. Many of the surveyed restaurants are located in transnational hub cities where international travelers are a significant factor. Foreign tourists and business travelers take advantage of the weak dollar to treat themselves to otherwise more expensive wines when they dine in the U.S., thus driving up the price averages. This is not an insignificant factor for many of the upscale urban eateries that participate in the Wine & Spirits survey. Prices continue to rise for even the most inexpensive restaurant wines. About 35 percent of the restaurants reported that they have increased the price of the least expensive wine on their list in the last year. In my experience, however, no one ever orders the least expensive bottle on a wine list. The real indicator would be the price of the second cheapest bottle. I imagine that it costs more now, too.With the price of wine edging up relentlessly it is not surprising to find that restaurants and wine drinkers are paying more attention to by-the-glass sales. More restaurants are offering more wines (and more interesting wines) by the glass as well as the bottle. The average price reported by the survey rose to a new high of $11.05. The trend toward rising wine prices is not likely to slow very much in the future (see my previous post about The End of Cheap Wine), but this trend is not uniform across the entire wine list. Surveyed restaurants reported steep declines in sales of Merlot and Chardonnay, for example, and flat sales of Cabernet Sauvignon. Average sales prices actually declined for Cab and Merlot. Pinto Noir prices and sales have increased again, as you might expect. No sales trend data were reported for two supposed “hot” wines: Riesling and Syrah. Riesling is the sommelier’s favorite, according the Wine & Spirits (and I don’t disagree), because it is so food-friendly, but it does not seem to be an important factor in restaurants sales. I have my own theories about this, but no facts, so I won’t speculate at this time. I’ll try to find out more at the Riesling Rendezvous that Ste Michelle Wine Estates is organizing this summer. The case of Syrah is interesting, too. Wine & Spirits says that there was a Syrah/Shiraz boom a few years ago, but that it has faded and Syrah has now settled into a minor niche-role on the restaurant wine list. I suppose that this reflects the changing circumstances of Australian wine (see The Wizards of Oz) more than anything else since so many people identify Australian wine with Shiraz and vice versa. The fact that Riesling and Syrah don’t figure prominently in restaurant sales suggests to me that restaurant buyers as a group are less adventurous than you might think. Rather than using an unfamiliar wine list as an open invitation to experimentation I think they might on average be looking to avoid making a faux pas, either in terms of the wine they choose or the social signals that they send to the others seated around the table with them. Wine trends in restaurants might, therefore, lag behind wine trends generally rather than leading them. Or it could be that restaurants believe that their patrons are unadventurous and wine lists reflect this, focusing mainly on old standbys rather than hot trends. The result would be the same in either case. If this is true then Riesling and Syrah will move up on the restaurant wine lists, if they do at all, only after they have become more prominent in other wine venues. Or at least winegrowers in Washington State should hope that this will happen. Because, my goodness, we seem to be making a lot of Riesling and Syrah!